Two years removed from its all-time high, customer satisfaction with the retail sector falls for a second consecutive year. Fourth quarter data from the American Customer Satisfaction Index (ACSI) show a slide of 2.6 percent to 74.8 on a 100-point scale. Despite the decline for 2015, the overall score for retail stands almost exactly at its long-term average. Among the six retail categories covered by the ACSI, all drop but one: gas stations. Due to the lower cost of fuel, customers are more satisfied. Internet retail, which includes websites of brick-and-mortar stores, remains ahead of every other retail category despite a 2.4-percent drop to an ACSI score of 80. Every single online company shows deteriorating customer satisfaction, but Amazon continues its dominance at 83, remaining among the highest-scoring companies in all of the ACSI. Online retail sales growth year over year was about 13 percent for the holiday quarter, but Amazon nearly doubled that pace at 22 percent. Netflix raised its subscription price for new customers in October and existing customers will be impacted later this year. Its customers have shown price sensitivity in the past, and its ACSI score drops 6 percent to 76 as subscriber growth also slows. Computer and electronics online retailer Newegg scores 79, while eBay and Overstock bring up the rear at 75 and 73, respectively. The group of all other online retailers matches the category average of 80. Department and discount stores offer a case in point for the return to long-term averages, as the category loses 3.9 percent to 74 and returns to pre-recovery levels of customer satisfaction. Although no company has improved customer satisfaction, the top and bottom companies remain in place. Nordstrom has an ACSI score of 82, which is the best in class; a position it has held every year. Wal-Mart remains in the basement with a score of 66. The next closest chain, Sears, is 5 points higher at 71. Macy’s 8 percent drop to 73 returns the company to near pre-recovery customer satisfaction levels, but the large decline coincides with a disappointing holiday season. Among “dollar” stores, Dollar Tree (76) edges out Dollar General (74). ACSI newcomer Fred Meyer cracks the top three for department and discount stores with an ACSI score of 79, just behind Dillard’s at 80. Kohl’s scores 77, and Target (75) comes in just ahead of J.C. Penney and new ACSI entrant Ross (both 74). After several years of pretty high customer satisfaction, supermarkets register their lowest score in more than a decade, dropping 3.9 percent to 73. A wide range in customer satisfaction for supermarkets suggests that it is possible to please customers even though overall satisfaction is down for the industry. Wegmans, one of three retailers to improve customer satisfaction, gains 1 percent to 86 and becomes one of the highest-scoring companies in the Index. Other top-scoring supermarkets include Trader Joe’s (83), H-E-B (82) and Publix (82). Giant Eagle and Wal-Mart at 67 find themselves at the opposite end of the scale. Albertsons, which recently merged with Safeway, rounds out the bottom three at 68. “When consumers put a premium on service and quality, smaller companies often achieve higher customer satisfaction scores, and it’s the smaller independent chains that continue to set the bar for supermarkets,” says VanAmburg. 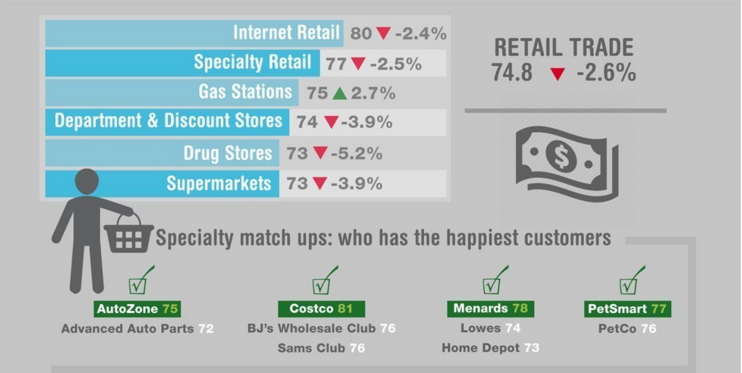 The biggest loser in customer satisfaction among supermarkets is Target. It plummets 12 percent to 71, followed by Whole Foods, which dives 10 percent to 73. Competition for natural and organic foods has been heating up as Whole Foods struggles with a reputation among food shoppers for unjustifiably high prices. Specialty retail slips 2.5 percent to 77, but is still above where the industry was before the Great Recession. L Brands, which owns Victoria’s Secret and Bath & Body Works, joins Costco atop the specialty retail ratings at 81. Despite its thinning retail presence, Barnes & Noble continues to beat the industry average for customer satisfaction with a score of 79. Video game mega-retailer GameStop bucks the negative ACSI trend, up 1 percent to 78. Among 22 specialty retailers, 15 are below the industry average for customer satisfaction. Abercrombie & Fitch, which debuts at 65, is the lowest-scoring company in the retail sector. Over the last two years, both its revenues and profit are down, and its stock has followed suit. Home improvement competitors Lowe’s (74) and Home Depot (73) haven’t been this close in customer satisfaction since 2011, a time when the housing market began to show signs of recovery. Costco competitors BJ’s Wholesale Club and Sam’s Club tie at 76. Newcomer AutoZone (75) comes in ahead of its rival Advance Auto Parts (72), also a new entrant in the ACSI. Among other clothing retailers, TJX (TJ Maxx, Marshalls) remains at 78 for a second year in a row. Burlington Coat Factory makes its first appearance at 76 and Gap (Gap brands, Banana Republic, Old Navy) is in line with its long-term average at 75. Health and personal care stores suffer a steeper decline in customer satisfaction than any other retail category, shedding 5.2 percent to a record low of 73. Wal-Mart’s drug stores are at the bottom with 68 and the company scores last in every retail category covered by the ACSI. Walgreens, the largest drug store retailer, falls 4 percent to 74. Rite Aid plunges 12 percent to 69, tied with Safeway’s in-store pharmacies. Kroger at 81 and Target’s in-store pharmacy business at 80 lead for customer satisfaction among pharmacies. CVS has recently acquired Target’s drug store operations. Given CVS’s much lower customer satisfaction (71), it will be interesting to see if the merger will help CVS more than it will hurt the Target. 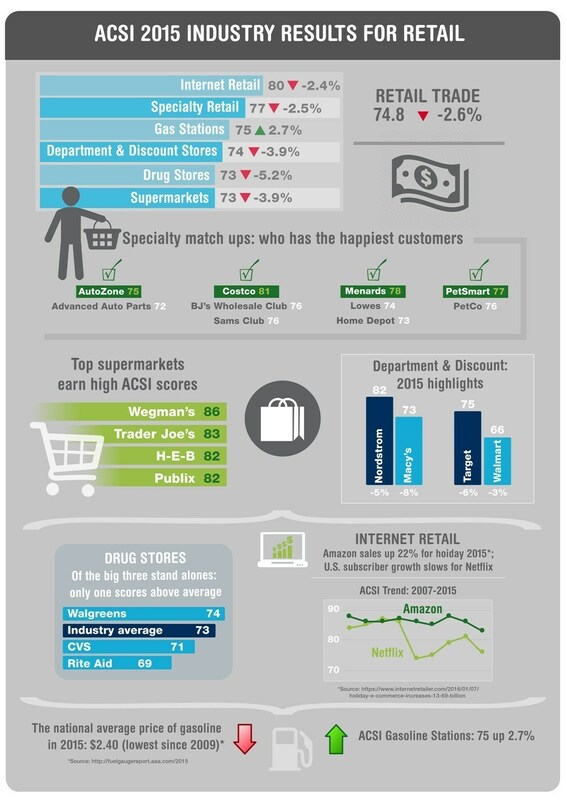 ACSI Retail Report 2015 is available on the ACSI website at http://www.theacsi.org/news-and-resources/customer-satisfaction-reports/reports-2015/acsi-retail-report-2015. Follow the ACSI on Twitter at @theACSI and Like us on Facebook. No advertising or other promotional use can be made of the data and information in this release without the express prior written consent of ACSI LLC. The American Customer Satisfaction Index (ACSI) is a national economic indicator of customer evaluations of the quality of products and services available to household consumers in the United States. The ACSI uses data from interviews with roughly 70,000 customers annually as inputs to an econometric model for analyzing customer satisfaction with more than 300 companies in 43 industries and 10 economic sectors, including various services of federal and local government agencies. ACSI results are released throughout the year, with all measures reported on a scale of 0 to 100. ACSI data have proven to be strongly related to a number of essential indicators of micro and macroeconomic performance. For example, firms with higher levels of customer satisfaction tend to have higher earnings and stock returns relative to competitors. Stock portfolios based on companies that show strong performance in ACSI deliver excess returns in up markets as well as down markets. At the macro level, customer satisfaction has been shown to be predictive of both consumer spending and GDP growth.